Investing in the next big thing is overrated. A safe stock is one that has little chance of creating a permanent loss for investors in the long run. There are plenty of unsafe stocks that may seem safe, because the company is solid or because the stock price has been going up for years. But safety requires both a high-quality company and a reasonable valuation. Overpaying for a wonderful company is not a safe thing to do. According to three of our contributors, Johnson & Johnson (NYSE:JNJ), Disney (NYSE:DIS), and Enterprise Products Partners (NYSE:EPD) are some of the safest stocks around. Here's why. Brian Feroldi (Johnson & Johnson): If safety is what you are after, then it is hard to think of a better stock to buy then healthcare conglomerate Johnson & Johnson. This company owns more than 250 operating subsidiaries that sell thousands of products around the world. Furthermore, no one can control when they get sick, which keeps J&J's products in demand no matter what kind of economic chaos is going in the world. When combined, these factors helps to make J&J's business extremely predictable. For evidence of how reliable this business has become, consider this fun fact: J&J has increased its adjusted earnings for 32 years in a row. Better still, the company has boosted its dividend payment to investors for 54 consecutive years. Both of these impressive time periods span periods of economic uncertainty, including the great recession. And yet, through it all, J&J's brand strength and product diversification have helped to ensure continuous profit growth. Looking ahead, J&J's strong pharmaceutical pipeline provides plenty of reasons to believe that the company's track record of success will continue. The company boasts 10 potential blockbuster drugs that could be on the market by 2019, providing investors with multiple shots on goal. Add in the potential for label expansion claims on existing drugs, steady price increases, and the occasional tuck-on acquisition, and I'd argue that J&J's track record of growth will remain intact for years to come. Tim Green (Disney): One good way to tell whether a company is safe to own is to look how long it's been around. If a company has been successful for decades, adapting as necessary to stay one step ahead of the competition, there's a good chance that it will continue to do so. That's not always true, and it shouldn't be the only reason for buying a stock. But staying power is important. Disney has been around for over 90 years. Theme parks remain a key component of the company, but its cable networks generate a tremendous amount of profit each year. ESPN is a cash cow for Disney, but it's not the only one. Disney's acquisition of Marvel and LucasFilm in recent years has given the company's movie business a long runway for growth. That business grew 28% in fiscal 2016, generating $9.4 billion of revenue. With the rise of video streaming services threatening the cable TV business, Disney faces a challenge when it comes to ESPN. Subscribers are in decline, and the company's dominate position providing sports programming is under threat. This is where Disney's long history works in its favor. Betting that the company can't figure out how to thrive under different conditions would be betting against its long track record of doing just that. Disney has its fair share of problems, but the stock looks like a safe bet for long-term investors. Matt DiLallo (Enterprise Products Partners): Investors seeking safety tend to focus on three criteria when reviewing a potential investment: The stability of cash flow, the strength of the balance sheet, and visibility into future growth. While there are plenty of companies that meet these criteria, few meet them as well as pipeline giant Enterprise Products Partners while selling for a reasonable price. For example, roughly 85% of the company's revenue comes from fee-based assets, which provides it with very stable cash flow. In fact, cash flow has continued to rise over the past couple of years despite a significant drop in commodity prices thanks to several new fee-based assets it has added into the fold. Meanwhile, the company has one of the strongest credit ratings among MLPs at Baa1/BBB+ thanks to its low leverage, which has typically been below 4.0 times debt-to-EBITDA when most of its peers are comfortable with leverage ratios north of 5.0 times. Finally, the company currently has $5.3 billion of fee-based growth projects under construction, which provides ample visibility for future growth. As that chart shows, the company's valuation, while not dirt cheap, is toward the lower end of its five-year average. 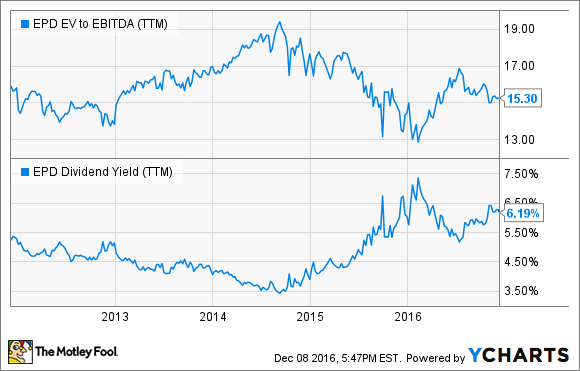 Meanwhile, the dividend yield is well above its historical average. Add it up, and this is a dependable long-term investment selling for a very reasonable value.